On this page we are happy to present you the proud owners of their plane from Rplanes. We would be pleased to add you here too. 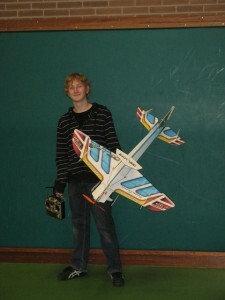 So if you want you and/or your model on this page, please sent a photo to info@rplanes.nl. This can be a static or action photo, as you want. Please add some additional information about you, your model and the setup which will be mentioned next to the picture. Mr. Ron Smetsers from The Netherlands with his Donuts models Deluxe v3. His model is powered by Axi 2203/46 and FS 31 servo’s.